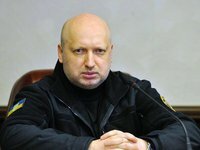 National Security and Defense Secretary Oleksandr Turchynov has commented on new Russian sanctions against Ukrainian citizens and legal entities. "They scared hedgehogs with their bare derrieres! This is the only comment I can give about Russian sanctions against Ukraine," Turchynov said on his Facebook page on Thursday.